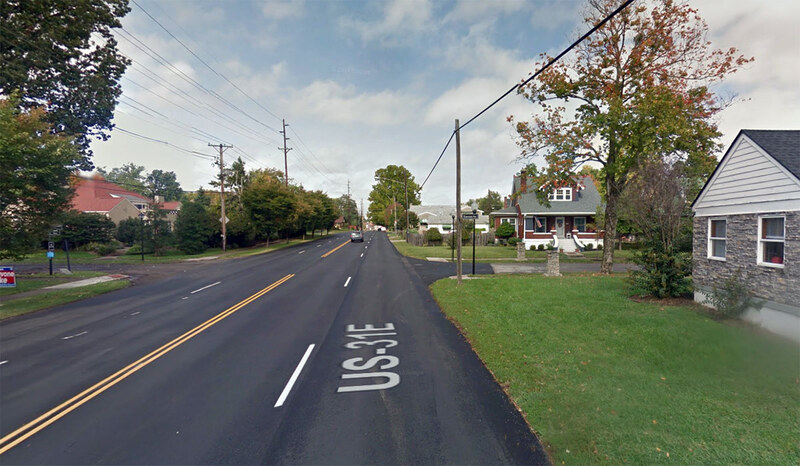 A man was struck and killed by a hit-and-run motorist Sunday night at Bardstown Road and Emerson Avenue. Police found the victim Sunday morning around 6:00a.m. and the motorist is still at large. The incident was covered by WDRB (with update), WHAS11, WAVE3 (with update), WLKY, and the Courier-Journal. An investigation by the Louisville Metro Police Department (LMPD) revealed that Calvin E. Watkins, 51, was struck by a motorist travelling eastbound on Emerson Avenue, but police are unclear of when the collision took place. There were no witnesses. Conflicting reports note that Watkins was either crossing Emerson when he was struck or else walking eastbound along Emerson in the street when the motorist struck him. Emerson Avenue carries a posted speed limit of 25 miles per hour and this stretch of Bardstown Road is posted at 35 miles per hour. According to studies, a person struck at 25mph has a 90 percent survival rate while a person’s chance of survival when struck at 35 drops to around 50 percent. The eastbound side of Bardstown Road has no sidewalks in this area, although the pleasant residential street Emerson Avenue does have sidewalks. Emerson is just three blocks from Assumption High School and not much farther from Atherton High School. Police are asking for help finding the hit-and-run motorist. According to LMPD, the vehicle is likely light blue in color and could have a broken or shattered windshield. Anyone with information is asked to call the police tip line at 502-574-LMPD. Watkins was identified as homeless and the Jefferson County Coroner is also asking for help locating Watkins’ next of kin. Anyone with information can call 502-574-0123. The local media did a much better job of reporting this incident. WAVE3 had the best of the group as their update was the only to note that a person was driving the vehicle involved in the collision. WDRB’s update and the C-J’s report were the only two to label the collision an accident rather than a crash. This incident is the second pedestrian fatality of 2016, the third reported pedestrian collision, and the second hit-and-run. Louisville is still in the midst of a pedestrian safety campaign called Look Alive Louisville that was awarded a federal grant due to the city’s above-the-national-average rate of pedestrian fatalities. Branden: you can cannot reduce or diminish the importance of any untimely loss of life. With that said, though, there is a simple solution that will drastically reduce our city’s pedestrian fatality rate. It is a solution that also does not require spending federal funds. Simply look both ways and cross only when the street is clear. While some responsibility obviously falls to the pedestrian when crossing a street, I think Louisville’s traffic fatality statistics prove that there is a bigger issue at hand than people not looking both ways. Louisville’s streets foster a culture of aggressive driving with few repercussions. I make few commutes in town where I don’t see at least one instance of a driver behaving recklessly and endangering public safety. Yokevino: You cannot be hit if the street is clear. Good luck finding a moment where Dixie Highway is clear; or Preston, Shelbyville Road, Hurstborne Lane. We have serious pedestrian infrastructure problems. Are you defending the driver in this instance? It was a hit and run! Purely despicable. For all we know the driver swerved into the man crossing on the opposite side. Yokevino – Your are right that a pedestrian might need to wait until it is safe to cross a busy road. Last year I was at a Dixie Hwy auto repair shop, and I had to wait wait for at least a minute or two to safely cross the street while I was killing time. Look both ways and wait till it is safe to cross. You’re missing the point entirely. There are some streets, (including your example street) that are never 100% safe to cross. Cars can turn out of a neighborhood 30 yards away and be present where they weren’t previously. I assume you’re not elderly, handicapped, or a mother with 3 children. Not that you would have to be. Can you imagine actually commuting 3 miles on that stretch not in a car? Some don’t have to. Any logical person can look at Dixie Highway and see it for what it is. It’s not even safe to cross the parking lots or walk the sidewalks. The Federal Government thinks it’s bad enough we received a $30 million Tiger Grant, but wait….that’s what has you all up in arms in the first place. Yokevino: Like the vast majority of Louisville residents, I do drive to work and to shopping. I don’t walk 3 miles down Dixie Highway to commute. If one needs or wants to commute and shop regularly on foot or by bus, then Valley Station or Okalona or Hurstbourne is not a good choice. There are many different types of neighborhoods in Jefferson County that suit a variety of needs and lifestyles. Like I suggested before, though, even the busiest street can be navigated if the pedestrian is willing to wait for a minute of two until it is safe to cross. That really is the point. Respectfully disagree, and our fundamental anchor points on the issues we discuss are so far apart that I doubt there is much common ground to be had here. I don’t believe mass motor vehicle transport should ever be the only way to effectively and semi-safely navigate terrain in an urban environment. I don’t accept suburban sprawl and poor zoning as sustainable, and I don’t think it’s a “lifestyle” an urban progressive city should be promoting. It contributes to our out of control urban heat island effect, and a staggeringly high pedestrian fatality rate. Our streets are not safe no matter how many times someone looks both ways, and to assume the majority of these deaths are caused simply by pedestrian carelessness is in my opinion absurd. Good day! Yokevino: So your position here really has little to do with actually preserving the lives of pedestrians in real life circumstances. Rather, you would use pedestrian deaths as an excuse to push an undemocratic agenda that is contrary to the will of the vast majority. Our suburbs, where people actually choose to live, are not compact, walkable European villages. The overwhelming majority prefers the mobility, freedom, and privacy of private automobiles over sitting with strangers on buses and being tied to public transportation routes and schedules. I love to ride my bike for exercise, and riding it to work or to shop sounds cool. Realistically, though, most of us cannot actually show up for work sweaty and disheveled nor would we want to attempt to carry home a 12-pack of paper towels on a bike. The private car is here to stay. Your anti-car agenda flies in the face of the needs and wants of most people in this country. This seems like a situation where you have decided that the masses are too ignorant to know what is best for them and that we need powerful “experts” to impose better choices. Churchill said something like, “democracy is the worst form of government except all those other forms that have been tried from time to time.” Even though freedom of choice can be a little sloppy, I still prefer it. Contrary to what a few may dream about, cars do have the right of way on roads. In order to actually save lives in the real world, look both ways and wait until it is safe to cross. I have no crusade against the car. I drive one almost everyday. You have taken my words and spun them to fit your expectations of my agenda. My only mention of cars was that I don’t think they should be a citizen’s ONLY safe option of navigating urban terrain. It’s very odd that you chose a hit-and-run pedestrian fatality article to discuss looking both ways before crossing the street. The driver fled the scene, yet you haven’t even mentioned it. Now the question begs, why? The most probable conclusion one may come to is that they were at fault, and not the man walking. Maybe they even tried to hit him on purpose? We can’t know for sure, but we can be sure that the driver was horrible human being. I also don’t think the masses are “too ignorant to know what is best for them”, that would be you thinking pedestrians are absentmindedly walking into the path of motor vehicles without first looking both ways. I don’t know Brandon and have no affiliation with this website but have enjoyed it off and on for years. I probably agree with 85% of what is posted here. He can correct me if I’m wrong, but the website has anti-sprawl sentiments. If you think I come here looking to push that agenda, I really don’t have to. It seems to be prevelant in the overall tone. It’s plain unsafe to walk or bike in the majority of JeffCo. So people don’t do it, obviously. The only people that do walk or bike either can’t afford a car, or come across as arrogant assholes, because who else would have the gall to use a road that’s obviously been designed for cars? Either way, these are not the upstanding people our electorate has any affection to. When out on the street, everybody carries a responsibility, to themselves and more importantly to others. That responsibility is easily quantified: the weight of your vehicle multiplied with the speed that you’re going. The same for a pedestrian, the same for a cyclist, the same for a rollerskater. Drivers in this city refuse – consciously or not – to accept that responsibility. The most frustrating part is that there is no excuse. Streets are WIDE in Louisville, almost excessively so. There’s no reason that you can separate users; a separate bike lane, usable sidewalks, perhaps a barrier here and there, some on-street parking. And cars would still have 3-5 lanes to move along! It’s not an either-or question. we can have both! the reason our streets are unsafe, are purely due to lack of will. Not because people like to see other people die, but because they can’t be bothered: homeless man getting run over on bardstown? probably drunk anyway. Somebody run over on dixie (again)? get a car deadbeat! hit on river road? that fitness-freak had it coming. Hit on broadway? these darn jaywalkers. It’s slowly getting better, I remember it being worse only a few years ago. So who knows, maybe things will continue to improve.